An Introduction to Technics Butane Blenders. Adjusting gasoline vapor pressure for your regional climate can enhance the profitability of your terminal and pipeline operations. A critical characteristic of gasoline is its Reid Vapor Pressure. The matter of vapor pressure is important relating to the function and operation of vehicles. High levels of vaporization are desirable for winter starting and operation and lower levels avoid vapor lock during summer heat. Fuel cannot be pumped when there is vapor in the fuel line (summer) and winter starting will be more difficult when liquid gasoline in the combustion chambers has not vaporized. Thus, RVP is adjusted at various times throughout the year to match the ambient temperatures of any given region. Beyond vehicle performance, environmental rules target the vapor pressure of gasoline to limit evaporative emissions resulting in greenhouse gasses. 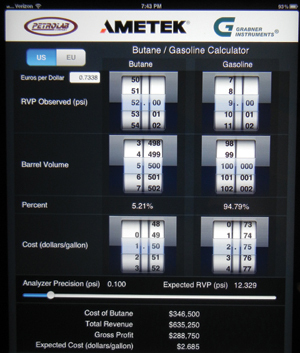 This changing composition of gasoline can provide downstream operations with an excellent opportunity to one, tailor the vapor pressure of gasoline for the specific region and two, provide additional profits to their operations. By blending in butane, the customer is effectively selling each gallon of low cost butane at gasoline prices. The spread may vary, but the expected increase in natural gas production would seem to indicate that the price of butane will continue to drop. For customers with trading operations, this can bring another dimension to their arbitrage. Figure 1 shows a typical Profitability analysis during the transition periods demonstrating this rapid ROI. Technics’ well-executed process delivers On-Spec product On-Time. 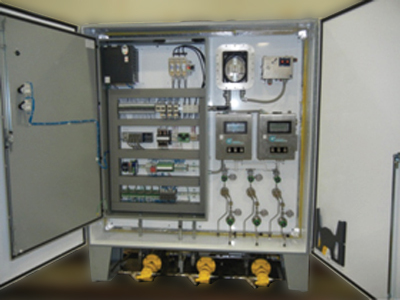 Our systems can be designed for bidirectional flow and the use of parallel controlled butane flow provides extremely tight dosing to within 0.05%. Proper pre-dispersion and homogenization ensures that our samples are completely representative of the process. Why not simply add butane in the storage tank? The problem is that the storage tank is designed to store Gasoline and not LPG’s. The possible effects on a floating roof or other vapor control methods can be very costly. OK, how about into the Tanker. Keep in mind that that is your customer’s tanker and he has somewhere to go. A few thousand gallons is not going to leave much room for correction, so there’s that possibility of an illegal product at worst and a missed profit opportunity at best. Technics’ blending systems homogenize a precise blend to RVP specifications within 0.1 psi on the pipeline. While blending can be performed throughout the year, the highest profitability happens during the short transition periods. Therefore we approach our equipment as Mission-Critical. We utilize two analyzers and duplex sampling loops to ensure that operations continue during critical blending periods. The Compact RIO control system provides an Ultra-Rugged, High performance Platform for performing this complex and critical task. Technics Process systems are fabricated by ASME Certified Welders and in complete Conformance with ASME B31.3 as a standard but we are well versed in fabrication to any international standards such as API and GOST. 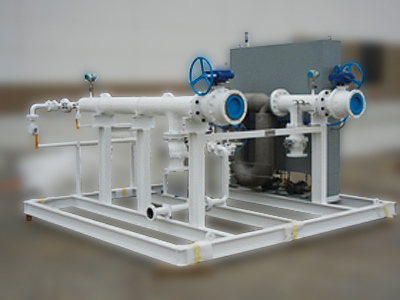 This 8” system processes up to 4000 BPH. The Technics Blending Process is powered by our LOGOS platform for analysis and control. Embedded in the ultra-rugged Compact RIO, the process is not reliant on the terminals computer network yet others access and integration to the terminal and corporate MIS. A typical operation is as follows. LOGOS places the system in ready mode and it immediately samples the butane feed, measures and records the RVP. After the butane is recorded, the system sits idle waiting for gasoline flow. Once detected the raw gasoline is sampled and its vapor pressure and density are recorded. The system begins to add butane to the flow. The amount of butane delivered is calculated through a specific algorithm equating the density and RVP of the feed streams along with certain assumptions on their composition. 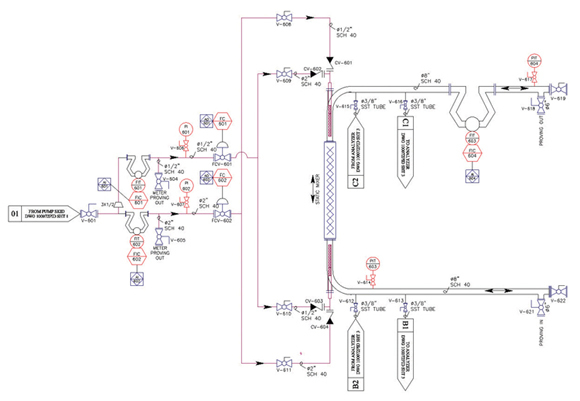 At this point the system begins analyzing the homogenized fuel and adjusts the transfer of butane to match the overall target given the value of the blend already transferred to the storage tank. The system re-enters idle mode when the gasoline flow is stopped. A batch report is generated and stored in the computer. The deviation between calculated and actual RVP is used by the computer to modify its stored algorithm in preparation for the next transfer.